My neighbor, Peg, is a master gardener. I'm talking a gardener extraordinaire. A gardening guru, if you will. Her yard is so spectacular that I've found myself visiting her quite often, seeking advice on what kind of perennials to put in the lackluster rock garden that I'm trying to create at the front of my house. I suspect she's tired of me always showing up at the fence whenever she's outside, because a couple of weeks ago she gifted me with a ton of starts. It's probably her nice way of getting some time to herself. It's working, because I've stayed busy transplanting and watering and weeding and cussing out the alders that keep creeping into my garden. 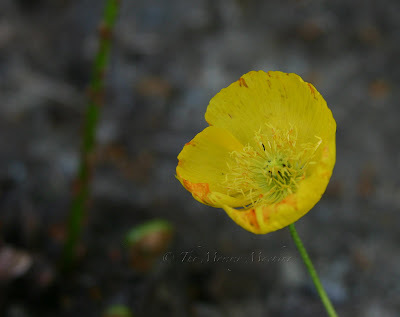 This arctic poppy opened the very next day after I put it into the ground! 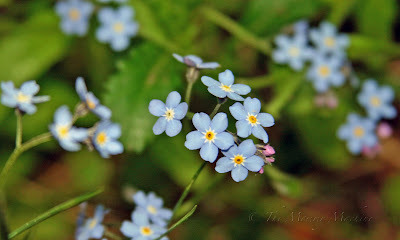 I'm so grateful for the hardy forget-me-not. but they keep showing up year after year. 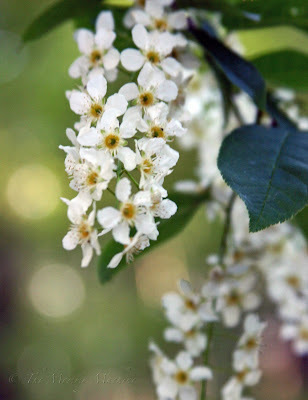 fragrant, blossoming tree that shades my yard. Looks like I'll be harassing Peg today. I am gardening challenged too! I keep hounding some fellow bloggers who are gardening gurus with my constant questions and garden pics!! Your flowers look lovely...your thumb is way more greener than mine! Thanks for the comment! And good luck with the garden. Around here, if it doesn't take care of itself, it usually dies. Apparently not only am I a mediocre gardener, I'm also a marshmallow. We are turning a patch of grass into a vegetable garden, but we have to take out the sod first. I used a hatchet for 10 minutes to clear about 3 square feet of earth, but after that I had to go inside to nurse a nasty painful blister on my finger. Boo-hoo, poor baby. Not only that, I had to look at several icky worms and grubs, and now I also have to clean out under my fingernails. Oh, honestly. . .
Tell me, does cussing at your plants work? If it does up in Alaska, then it is high time for my plants to start listening to what I have to say.